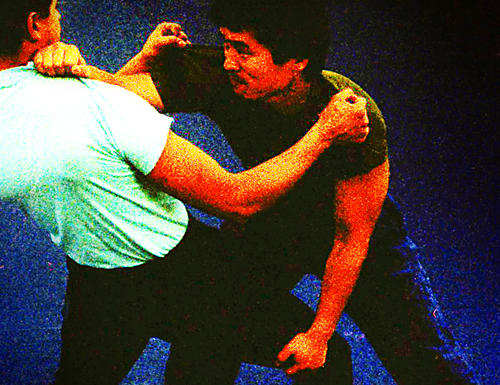 Opposing force combinations are pairs of skills that apply force in antagonistic directions. They consist of at least two distinct movements that work in opposition to each other yet are complementary. They often look similar to circular force combinations but there is a conspicuous distinction. Circular force skills can be traced to a single line of movement around one axis. Opposing force skills move in intersecting lines or arcs. Like circular combinations, opposing force combinations can be studied in terms of striking skills and grappling skills. Opposing force strikes are often used to set each other up. An example is a left hook to the head followed by a right hook to the head. The left hook will start the opponent’s head moving to the right. When you follow with the right hook, the force created by the left hook, combined with the weight of your opponent, will crash into the force of your right hook, to increase the damage done. By using the left hook as a set-up, you intensify the effect of the main technique, the right hook. To summarize, in striking, increase the force of the second technique by preceding it with an opposing force strike. In grappling, apply force in one direction, then reverse the direction of the force and use your opponent’s resistance against him. These are the basic theories behind the secondary response. Book 3 and Book 4 of Combat Strategy build on these concepts, introducing the strategic nuances of the secondary response in more depth. Like this article? Learn more about Junsado principles, strategies, concepts and techniques from Combat Strategy by Hanho. This entry was posted in Junsado Fundamentals and tagged combinations, fighting, fundamentals, junsado, self-defense, techniques. Bookmark the permalink.